All homes require a ventilation system. Ventilation systems bring fresh air into your home while also exhausting stale air year-round, even when windows and doors are closed! This exchange provides air that keeps occupants healthy, removes odors, reduces moisture, removes indoor pollutants and lowers the relative indoor humidity. GeneralAire® Energy Recovery Ventilators are balanced ventilation systems. ERV systems transfer heat and moisture during this exchange of air. All homes require a ventilation system. Ventilation systems bring fresh air into your home while also exhausting stale air year-round, even when windows and doors are closed! This exchange provides air that keeps occupants healthy, removes odors, reduces moisture, removes indoor pollutants and lowers the relative indoor humidity. 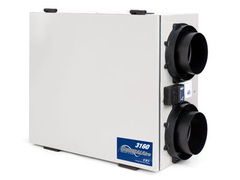 GeneralAire® Heat Recovery Ventilators are balanced ventilation systems. HRV systems transfer and maximize heat efficiencies during this exchange of air. Download ERV/HRV Installation & Owner's Manuals. I Need ERV/HRV Replacement Parts.